This module shows how one input box can be used with comma delimited list of the five parameters to operationalise the Black-Scholes model. The parameters are split, then assigned to a dynamic array. 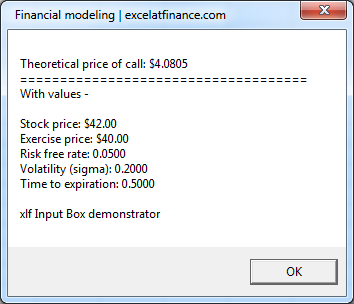 The procedure returns the option price with a list of inputs in a message box. The input box uses the VBA InputBox method. Default parameters are shown in figure 1. The VBA code for the input box is shown in code window 1. To allow easy testing of the input box method, the user is able to allow default values by setting the switch in line 11. TRUE displays default values, FALSE disables the default value feature. The CANCEL buttons exits the procedure. If Switch Then Default = "42, 40, 0.05, 0.2, 0.5" Else Default = ""
Line 21 uses the Split function with a comma delimiter as the second argument. When the five parameters are assigned to the ID array, the line 23 code passes the values in the array elements to the BSCall function procedure - lines 37 to 44. ID array is zero based, with element values ID(0): 42; ID(1): 40; ID(2): 0.05; ID(3): 0.2; ID(4): 0.5. The Base 1 declaration in line 2 has no effect on the LBound value of ID. Line 24 to 32 of code 1 then displays the message box shown in figure 2.